Escape Room is a 2019 psychological horror film directed by Adam Robitel and written by Bragi F. Schut and Maria Melnik. The film stars Taylor Russell, Logan Miller, Deborah Ann Woll, Tyler Labine, Jay Ellis, and Nik Dodani, and follows a group of people who are sent to navigate a series of escape rooms, only to discover that their fates are tied to whether or not they can beat them in time. 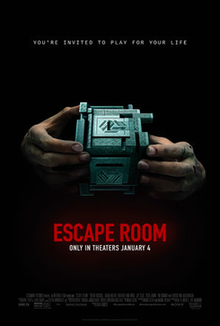 Escape Room was released in the United States on January 4, 2019, by Sony Pictures Entertainment, and was a box office success, grossing over $154 million worldwide. The film received mixed reviews from critics, who praised the atmosphere and cast, but criticized the familiar plot and its failure to take full advantage of its premise. A sequel is planned for release on April 17, 2020. In Chicago, Illinois, physics student Zoey, stockboy Ben, daytrader Jason, war veteran Amanda, trucker Mike, and escape room enthusiast Danny receive invitations to the Minos Escape Room Facility for a chance to win $10,000. As everyone arrives they gather in the facility's waiting room and find out they are locked inside, thus beginning the game. Searching for clues, Zoey inadvertently activates heating traps; as the heat intensifies, Zoey manages to unlock a vent by pushing down coffee coasters. As the players make their way through, Amanda has a flashback of crawling through the aftermath of an IED attack in Iraq. Everyone escapes just before the room is engulfed in flames. They find themselves in a winter cabin, with the door locked by a seven-letter combination with the hint being "You'll Go Down in History". The room's clues trigger Ben to have a flashback of driving drunk with friends, singing "Rudolph the Red-Nosed Reindeer" before crashing the car. He suggests "Rudolph," which unlocks the door, and the group escapes into a room resembling a frozen lake. They find the locked exit and a single red coat, and use a fishing pole and magnet to retrieve a key encased in an ice block. Danny falls through the ice and drowns, and the remaining players are forced to melt the ice block with their body heat to free the key. Jason has a flashback of freezing beside someone in a red coat; the players unlock the exit as the ice explodes and collapses. The five players enter an upside-down billiards bar, and the song “Downtown” begins to play on repeat. In a version of musical chairs, whenever the song stops, a section of floor falls away, revealing a long elevator shaft. They find a locked safe, and identify a missing 8 ball as the key to the room. Zoey has a flashback of the aftermath of a plane crash, and realizes the puzzle's clues are upside down. Amanda retrieves the eight ball from the safe, but accidentally drops it. Sacrificing herself, she throws the ball to Jason before plummeting to her death. The four remaining players enter a hospital ward with six beds, and discover all the players were sole survivors: Zoey survived a plane crash; Jason, a boat accident with his roommate; Ben, a car crash; Mike, a mining cave-in; Danny, carbon monoxide poisoning; and Amanda, an IED blast. They realize the entire game has been based upon the traumatic events they all lived through. They then deduce that the EKG machine will unlock the door to the next room. Jason inadvertently kills Mike with a defibrillator to open the door. As the room fills with gas, Jason hooks himself up to the EKG and lets the gas lower his heart rate, opening a passageway. Jason and Ben escape, but Zoey refuses to continue and collapses from the gas. Entering a room covered in optical illusions and strobe lights, Ben confronts Jason over his selfish disregard for the others, and Jason reveals that he survived the boating accident by killing his roommate for his coat due to survival of the fittest. They find and open a hatch in the floor but are drugged with a hallucinogen, and struggle against the effects as the room starts to spin. Ben finds the antidote and, in a struggle for the single dose, breaks his leg and kills Jason. Ben injects himself and falls through the hatch into an elaborate study room. As the walls start to close in, he solves the puzzle and narrowly avoids being crushed. Back in the hospital room, armed Minos employees enter the hospital room in hazmat gear to destroy evidence. Zoey, having survived, incapacitates them, seizes a gun and escapes the room into a maintenance area. Ben is then met by the Game Master, who has controlled the game as designed by the Puzzle Maker. He explains the true nature of the contest: players – college athletes, savants, lone survivors, celebrities, etc. – are lured and brought together by a shared experience, and wealthy viewers bet on who makes it out alive. The Game Master then tries to kill Ben to stop the game's secrets from being revealed to the public, but Zoey arrives; together, she and Ben manage to kill the Game Master and leave. As Ben recovers, Zoey tries to explain events to the police, but all evidence at the facility (which was an abandoned building the whole time) has disappeared. Six months later, Zoey shows Ben that the deaths of the other players have been staged as everyday accidents, and he agrees to join her on a flight to New York City to stop the Minos company. However, Minos and the mysterious Puzzle Maker are already a step ahead, preparing to make their flight a new deadly game. On August 9, 2017, it was announced that the film, then titled The Maze, had commenced casting. It was set to shoot in South Africa in late 2017. In January 2018, director Robitel told Syfy that production had wrapped and that the film would be released in September 2018. Brian Tyler and John Carey compose the score for the film. The soundtrack was released by Sony Music Entertainment, and includes the full score and a remix of the Escape Room Theme by Madsonik and Kill the Noise. In May 2018, it was announced that the film had been retitled Escape Room, and that it would be released on November 30, 2018. A month later, the film was pushed back to February 1, 2019, and later was rescheduled for January 4, 2019. In Poland, United International Pictures announced that the film's release in the country would be delayed for a while, out of respect for the five teenagers who had recently died in the Koszalin escape room fire. As of April 14, 2019[update], Escape Room has grossed $57 million in the United States and Canada, and $97.4 million in other territories, for a total worldwide gross of $154.3 million, against a production budget of $9 million. In the United States and Canada, the film was projected to gross $10–14 million from 2,717 theaters in its opening weekend. It made $7.7 million on its first day, including $2.3 million from Thursday night previews. It went on to debut to $18.2 million, surpassing expectations and finishing second, behind holdover Aquaman. The film made $8.9 million in its second weekend, dropping 51% and finishing fifth. On review aggregator Rotten Tomatoes, the film holds an approval rating of 48% based on 126 reviews, and an average rating of 5.1/10. The website's critical consensus reads, "Escape Room fails to unlock much of the potential in its premise, but what's left is still tense and thrilling enough to offer a passing diversion for suspense fans." On Metacritic, the film has a weighted average score of 48 out of 100, based on 24 reviews, indicating "mixed or average reviews." Audiences polled by CinemaScore gave the film an average grade of "B" on an A+ to F scale. On February 25, 2019, a sequel was announced as being in active development, with Adam Robitel set to return to direct along with screenwriter Bragi F. Schut and producer Neal H. Moritz. It is scheduled for release on April 17, 2020. ^ "Escape Room". AMC Theatres. Retrieved December 30, 2018. ^ a b c "Escape Room (2019)". Box Office Mojo. Retrieved April 14, 2019. ^ "Escape Room (2019)". The Numbers. Retrieved April 16, 2019. ^ a b Rubin, Rebecca (January 3, 2019). "'Box Office: 'Escape Room' No Match for 'Aquaman'". Variety. Retrieved January 3, 2019. ^ Jr, Mike Fleming (2017-08-09). "Logan Miller, Deborah Ann Woll, Taylor Russell Enter 'The Maze'". Deadline. Retrieved 2018-01-13. ^ "Deborah Ann Woll, Logan Miller to Star in Sony's 'The Maze'". The Hollywood Reporter. Retrieved 2018-01-13. ^ Wax, Alyse (2018-01-05). "How a new director helped Insidious: The Last Key change up the franchise". Syfy. Retrieved 2018-01-13. ^ Pedersen, Erik. "'Peter Rabbit 2' Gets Sony Greenlight; 2020 Release Date Set". Deadline Hollywood. Retrieved May 8, 2018. ^ "Sony Moves 'Escape Room' Up By A Month & 'Miss Bala' By A Week". Deadline Hollywood. October 12, 2018. ^ Scislowska, Monika (2019-01-07). "Victims of poland escape room fire to be buried together". The Associated Press. Retrieved 2019-01-09. ^ a b D'Alessandro, Anthony (January 6, 2018). "'Aquaman' Still The Big Man At The B.O. With $30M+; 'Escape Room' Packs In $17M+ – Early Sunday Update". Deadline Hollywood. Retrieved January 6, 2019. ^ D'Alessandro, Anthony (January 13, 2018). "'Upside' Set To Be STX's First No. 1 Opener With $19M+; 'Aquaman' Flips Over $1B WW; Keanu Reeves Hits B.O. Low With 'Replicas'". Deadline Hollywood. Retrieved January 16, 2019. ^ "Escape Room (2019)". Rotten Tomatoes. Retrieved January 29, 2019. ^ "Escape Room Reviews". Metacritic. Retrieved January 29, 2018. ^ Anthony D'Alessandro (February 25, 2019). "'Escape Room 2' Construction Underway At Sony For 2020 Bow – Update". Deadline Hollywood. Retrieved February 25, 2019. This page was last edited on 17 April 2019, at 06:23 (UTC).